Who? The overwhelming majority of you may be askng yourselves. Who is Ms. SooHoo? Well, boys and girls, Ms. SooHoo was only one of the best, albeit strict and no-nonsense, educators to ever grace a Chicago Public School classroom. And to this very day, I thank God almighty for blessing me to have been one of her many pupils. Once upon a groovy ol' time, back in the autumn season of 1982, I was a young girl of eleven attending John C. Haines elementary school in the Chinatown community on Chicago's South Side. And it was during that time that I had been assigned to Ms. SooHoo's class -- grudgingly at first, but eventually grateful. Ms. SooHoo was beloved to a fault, but just like every other member of our faculty back then, Ms. SooHoo didn't play. Seriously, she was not one to be trifled with. Anyhoo (no pun intended), I love(d) her deeply and dearly. And this post was created not only with her in mind, but also in her recognition. John C. Haines elementary school had its student body made up soley of African American and Chinese children -- save for the Galvin siblings who were the only Caucasian kids among us. We were all we had, and we loved each other - unconditionally. In terms of our education, there were exactly three (3) things that our teachers insisted on us having: a dictionary, a thesaurus, and an atlas. For according to the words of Mr. Melvin Gaynor (yet another phenomenon in the educational sector), not one of us was to succeed in life without a dictionary, a thesaurus, and an atlas. And the teaching staff saw to it that we children were equipped with those three basics. For we were never to show up at school minus said references. It was simple. If we Southside kids were nothing else, dammit, we would be highly educated! And that was that. We were indeed loved and well cared for. And I am now overcome with emotion as I recall and witness that time before all of you here today. 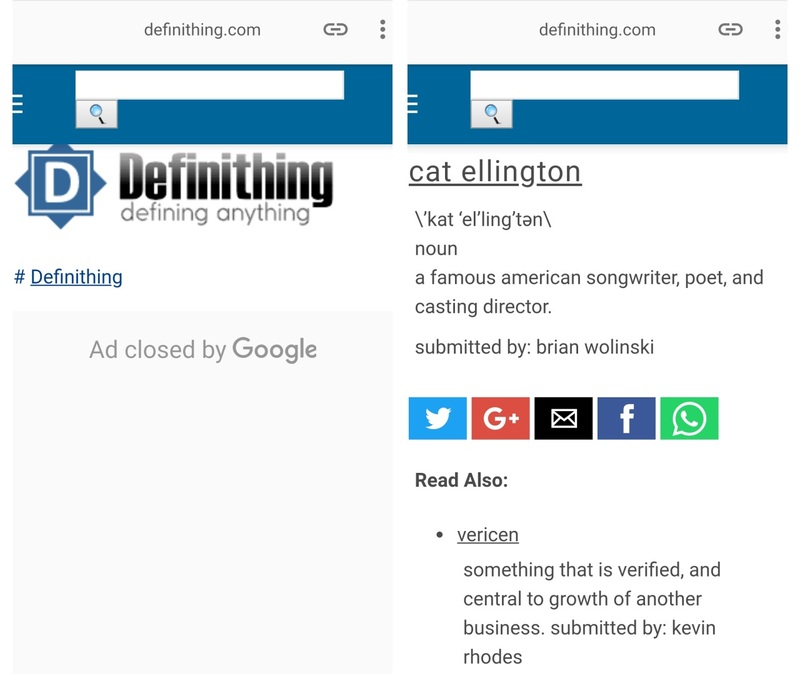 Taking into consideration that I have been listed in not one, but two, online dictionaries over the course of the last two weeks, including Urban Dictionary and now Definithing, it's safe to say that the now long retired Ms. SooHoo would be extremely proud of her kid, Cat. Yes, my China Mama would be. My dear men and women, according to Definithing, my name was added to its dictionary database by one Brian Wolinski. Now, I don't know Brian Wolinski. I've never met him; I don't even know what he looks like. But whoever Brian Wolinski is, I want to thank him for the great honor. Thank you dearest Brian. Because you didn't have to pick my name for the Definithing database, you could've chosen anyone else. But you did. And I am truly honored. Thank you, my dear. And one precious love. Boys and girls, it's Film Festival Season. And Joseph Strickland's and my baby, Dual Mania, has received its first Official Selection Laurel of 2018. We are enormously proud of this incredible honor, And the succeeding post will reveal my excitement even more so. Headlined "Don't Rest On Your Laurels," the post follows this one closely. Won'tchu join me fuh anotha Cat-sy posting? Groovy, baby.